When patients are in need of custom, metal-free dental restorations, the wait between appointments can feel like a lifetime. Thankfully, our doctors and specialists at Dental Innovations have invested in a state-of-the-art alternative to this traditional process – CEREC. CEREC technology simplifies the design, creation, and placement of your dental work down to a single, convenient appointment, all while maintaining the same lifelike quality and strength you deserve in a new crown, inlay, onlay, or other restoration. Better yet, there’s no one more qualified than Dr. Dubin to oversee this process for you; he teaches CEREC courses and is a mentor in this area for several nearby dentists. Contact our Montgomeryville, PA practice today if you have any questions for our staff, or if you’re ready to schedule your first appointment. CEREC begins with the preparation of the affected tooth or teeth and the capturing of digital impressions; these will be used by our team with the help of computer-aided design software to design the ideal restoration for your unique smile. Then, this information is transferred to our in-office manufacturing unit for its creation. After polishing the finished product and making any final alterations, your doctor will cement the restoration securely in place within your smile, ensuring a lifelike fit that feels great. That’s all there is to it – patients will be able to leave the same day with a corrected smile and a newfound sense of confidence. CEREC crowns and other restorations are metal-free, which makes them more aesthetically pleasing, biocompatible, and comfortable for patients. 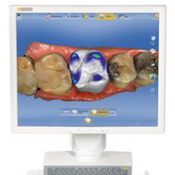 There’s no need for physical impressions with CEREC; the whole process is handled with digital software for a smoother and less “goopy” experience. Because the process is complete in just one appointment, patients from Montgomery County, PA and surrounding areas won’t have to worry about wearing a temporary restoration in the space between visits.